Judgment has its place today and in eternity. 1. There is a judgment of mankind for eternity. At the end of time, every person will stand before God who will judge them. God will divide those who do not belong to him from those who do. God is full of justice, requiring that every sin be punished. He is also full of love and mercy; he willingly paid the price for our sin through Jesus on the cross. Every person can be saved by faith from God’s eternal judgment. Because there is an eternal judgment, we must warn as many as possible about that Day. 2. There is a judgment of Christians in this life. Clearly, our faith in God to save us by reconciling us—forgiving our sin and crediting us with the righteousness of Jesus—clears us from ever experiencing God’s wrath. Yet, that doesn’t mean that God does not make judgements concerning us, and it does not mean that we will not experience God’s discipline based on his judgment. 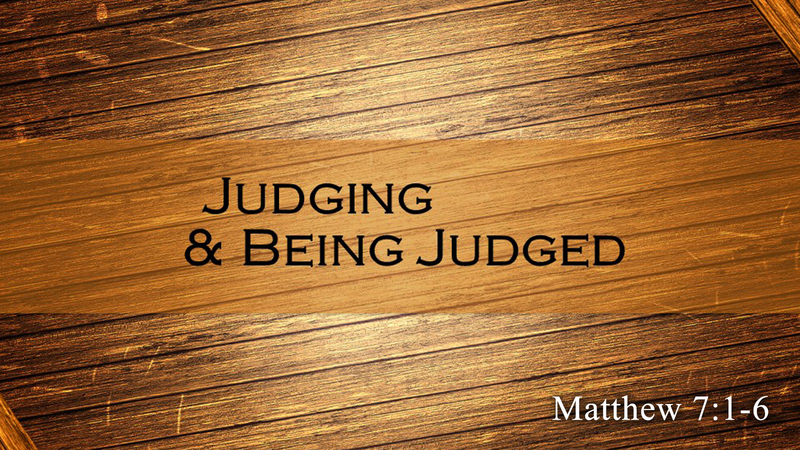 As Christians, we are instructed by God to judge ourselves. Failing to do so can have significant consequences. 28 Let a person examine himself…. 29 For anyone who eats and drinks without discerning the body eats and drinks judgment on himself. 30 That is why many of you are weak and ill, and some have died. 31 But if we judged ourselves truly, we would not be judged. 32 But when we are judged by the Lord, we are disciplined…. The purpose of the passage is to point out the necessity of judging ourselves. Why does God insist on us judging ourselves? Why does he judge us in this life if we fail to judge ourselves? The answer is simply that he is preparing us for eternal glory. 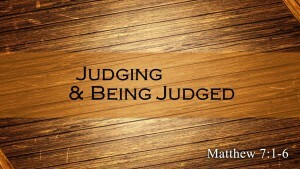 Focusing on judging others will keep us from rightly focusing on judging ourselves. Standing before Jesus Christ, while he is on his judgment seat, is not a determinant of our eternal destiny, whether we will spend eternity in heaven or hell, but it is a judgment that affects our eternity. Jesus warns that our judgment of others is measured back to us. · The standard that we require of people, will be the standard imposed on our own lives. · The standard which we claim to live, will be used to measure our actual living. Jesus illustrates that none of us are very good judges. Judging others is like looking for some dust in someone’s eye while you have a plank in your own eye. If we are really concerned with sin, then we would judge ourselves. When we are not serious about sin and righteousness, we attempt to point out the sin of someone else. Many unbelievers are turned off by Christianity because the church has people who are not very serious about righteousness. They talk about the unrighteousness of others, but they fail to judge themselves. The judgment that should be self-imposed is levied on the unbelievers. If you are really concerned about the sin of this world, then you must first concentrate on the sin in your own life.